As is clear from the full club name, Mortlake Anglian & Alpha Boat Club, we are the result of amalgamations of various clubs over the years. Mortlake Rowing Club is the oldest component part, established in 1877. Next came Anglian Boat Club which started in 1878 and later merged with Mortlake Rowing Club in 1962 to become Mortlake Anglian Boat Club. 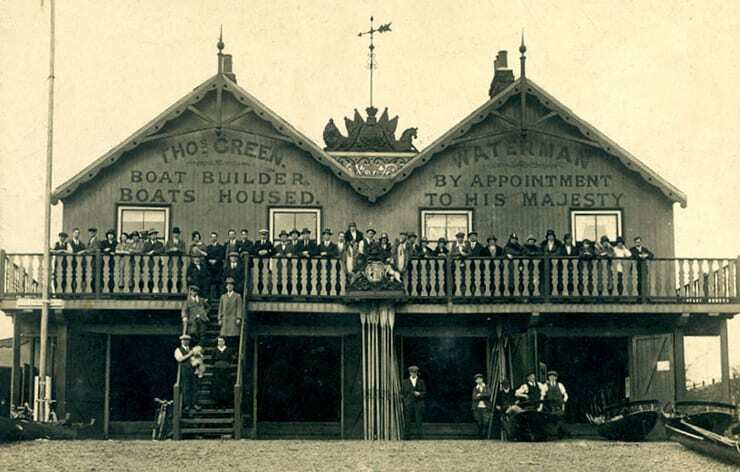 Chiswick Rowing Club was the result of the amalgamation of two local clubs, Bedford Park and Barnes Bridge & District and later merged with Mortlake Anglian Boat Club to become Mortlake Anglian & Chiswick Boat Club. Alpha Women’s Amateur Rowing Club formed in 1927 and was to merge with Mortlake Anglian & Chiswick Boat Club in 1984, which takes us to where we are today, Mortlake Anglian & Alpha Boat Club. Colin Cracknell has also recently prepared a great account of the influx of Scandinavian members to Anglian Boat Club in the 1880s, which led to some hard-fought Anglo-Scandinavian races within the club! Click here to view it (Word format, 7.85MB). All our historians have been members of the the club and its various amalgamations for many, many years. We are grateful to them all for their efforts in creating a detailed record of our history. Colin Cracknell, a former ‘Anglian’ member, has for some time been delving into the history of the club that he first joined. Colin’s much appreciated efforts are the catalyst in starting to assemble a history of our Club. Stan Roots, a member of Anglian Boat Club during the 1950s, was able to describe the events leading up to the amalgamation of Anglian Boat Club and the Mortlake Rowing Club. Stan sadly passed away in 2012 and is greatly missed. Michael Williamson, now living on the Clyde, is the doyen of former Mortlake RC members. We are very grateful to Michael for his contributions, in particular for providing many of the historical photos. John Hart, who joined Chiswick RC in 1963, also contributed his memories from the Chiswick era. Nina Padwick, a stalwart of the club and current President, has been able to provide a wealth of information about her former club, Alpha Women’s Amateur Rowing Club. What would be great now would be to find a volunteer – or two – who live locally and are willing to spend some time trawling the archives of the local newspaper offices in Richmond, and the ARA Library at Hammersmith, to try and dig out more facts about our past. If you would be interested in helping out please contact Nina (nina@maabc.com). If you already have any additional information about the club’s history, then we would really appreciate it if you could send it to info@maabc.com. We welcome all contributions, and thank those who have already contributed. We have many historic photographs of the club through the ages. As you wander along the Thames riverside do you ever wonder how people crossed the river before our modern bridges were built, about the trades and crafts associated with the river and how people enjoyed the river in Edwardian and Victorian times? The Thames Pilot website makes freely available images and documents from their archives and museums along the length of the River Thames.